TORONTO, ONTARIO--(Marketwire - Dec. 8, 2009) - Editors Note: There is a photo associated with this Press Release. 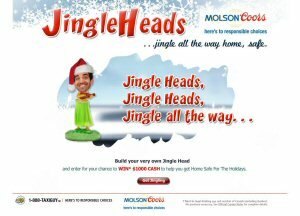 Molson Coors Canada's "Here's to Responsible Choices" campaign officially kicked off its holiday Jingle Heads e-card today to raise awareness and applaud those who choose to drink responsibly and make the responsible choice during the holidays. The e-card, which can be found at www.jingleheads.ca, allows users to customize a special message to a friend, family member or colleague. "The goal of this is to raise awareness and celebrate responsible choices. In order to do that, we know we have to engage people and make it fun; a part of the festive time of year when beer drinkers will be enjoying our quality products," said Amir Remtulla, Public Affairs, Molson Coors Canada. "We hope that people enjoy it and use it to thank whoever in their life has helped them make the responsible choice." The e-card allows users to upload a photo, and then choose a costume, background and one of three custom songs specially written for the occasion. The songs thank people for being a great friend, a designated driver or letting them crash on their couch. After sending an e-card, users can enter into a contest to win $1,000 towards safe holiday travel as part of Molson Coors Canada's Taking you Home for the Holidays campaign. The contest is open to residents of Canada (excluding Quebec) who are of legal drinking age. Complete rules and regulations are available at www.jingleheads.ca. 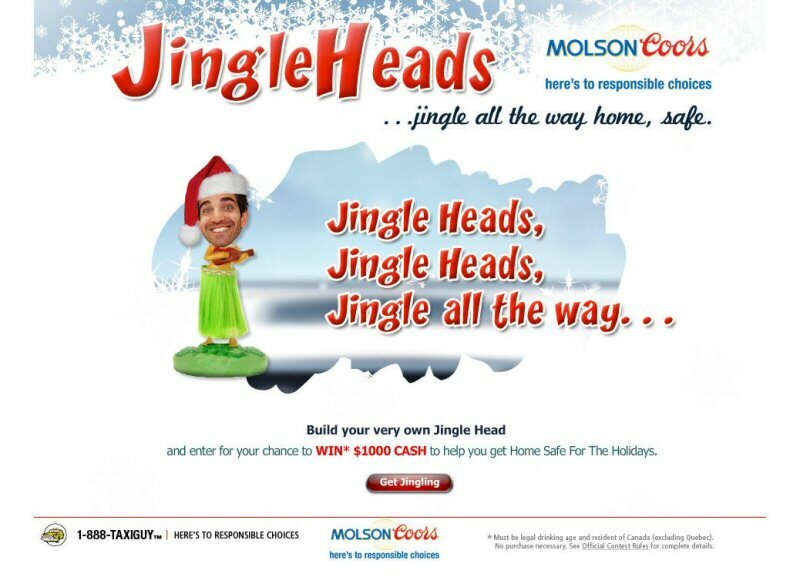 Jingle Heads is one component of Molson Coors Canada's Taking you Home for the Holidays responsible drinking efforts. In addition to the e-card, Molson Coors Canada is offering a nation-wide 10% discount on TAXIDOLLARS, in partnership with 1-888-TAXIGUY. Molson Coors Canada is also sponsoring various community efforts like free transit service in key cities on New Year's Eve, as well as spreading the holiday cheer by visiting local licensed establishment in several cities across Canada this holiday season to distribute $5 TAXIGUY vouchers. The holidays are a time when safe travel becomes that much more important because Canadians often make a point of traveling to meet family, friends and co-workers in holiday social settings. The "Here's to Responsible Choices" campaign is Molson Coors Canada's way of doing its part to help people make the responsible choice to get home safely throughout the year. Molson Coors Canada is the Canadian division of Molson Coors Brewing Company, a global brewer with operations in Canada, the U.S., U.K and Asia. The Company proudly offers some of the most popular brands in Canada with an award-winning brand portfolio which includes Molson Canadian, Coors Light, Molson Export, Molson Dry and Rickard's. Molson also partners with other leading brewers to offer such global brands as Heineken, Corona, Miller Genuine Draft, and Foster's Lager. Molson Coors Canada employs 3,000 Canadians, operates six breweries, including the boutique brewery Creemore, and invests in communities from coast-to-coast through its various charitable initiatives and sports and entertainment sponsorships. Molson Coors Canada is committed to promoting its products and events in a responsible manner.